Pacific columns endura-craft craftsman post-wrap columns are manufactured from an expanded-cellular composite that provides the look, feel, and workability of wood, but the advantages of a high-end composite material. They are resistant to cold, heat, moisture, and even insects, which gives them the ability to last virtually forever. Designed to wrap around an existing post, these columns have ez-lock joints that make installation the easiest you will find in the entire industry. The square, non-tapered, raised panel column with a standard capital and base is a perfect representation of the craftsman or bungalow style of architecture. This early-century design will transform a boring front porch into a classic architectural presentation. 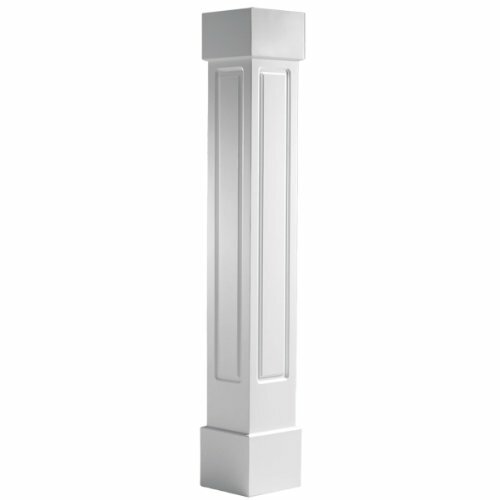 Endura-craft craftsman columns are versatile; they can be used either interior or exterior and with the hollow center and ez-lock joints, they are the perfect post-wrap column out there. Once finished, they have the look of a painted wood column. They are available in stock sizes ranging from 6 inch to 24 inch and heights of 4' to 12' with tapered and non-tapered styles, smooth, raised panel, and Fluted designs, standard, crown, and Tuscan cap and base sets. And if none of those fit your needs perfectly, they are also able to be custom made to virtually any size or style, ensuring you will find the perfect square column for your project.